Hi all! After surveying our members, the 2017–18 MGSS Executive Council has decided to create a new MGSS Facebook page, which is more flexible in keeping with the goals of our organization. On behalf of the MGSS EC, we invite you to follow us here. The old Facebook group is officially unaffiliated with the current MGSS Executive and the new page will be our official Facebook presence. The group has been renamed “Alumni of the McGill Music Graduate Students’ Society” and will remain active for students and alumni who wish to post content & connect. The MGSS EC will no longer be updating or posting events to this group in an official capacity. We also invite you to follow us on Instagram. If you weren’t able to make it out to our 2016–17 Winter GA and 2017–18 Fall GA, please find the results of our elections below. Congratulations to each member of the 2017–2018 Executive Committee and thanks to all MGSS members who voted in the elections. This year we are honored to welcome Dr. Benjamin Piekut from Cornell University as our keynote speaker and renowned bassoonist Nadina Mackie Jackson as our keynote performer. Click here to learn more. As the Fall semester approaches its conclusion, we’d like to invite you to join us for our final general assembly of the current term and end-of-term party. This event is a wonderful opportunity to celebrate and to reflect upon our accomplishments over the last term with free food, wine, music, and good company. The general assembly will be held on Friday, December 4th at 5:15 p.m. in A-832. The party will follow the conclusion of the assembly. An agenda and supporting documents will be sent via e-mail on November 27th. We are calling for nominations for the following vacant area representative positions: Music Technology, Percussion, Piano, Voice, Jazz, Early Music, and Conducting. Elections will be held at the GA. Those who wish to run for said positions must attend the GA OR email mgss.pgss@mail.mcgill.ca to let us know of their intent to run if they cannot attend. As an area representative, you are in an excellent position to foster community at the Schulich School of Music and to positively shape the experience of its graduate students. It is also an excellent opportunity to develop leadership skills working with a variety of other groups on campus. You may nominate yourself or a colleague. More information about each position may be found in the MGSS Constitution. We look forward to seeing you on December 4th. Until then, best of luck with your end-of-term exams, performances, papers, and projects! If you weren’t able to make it out to our Winter GA, please find the results of our election and that meeting below. Congratulations to each member of the 2015-2016 Executive Committee and thanks to all MGSS members who voted in the election. See you next year! Voting for MGSS Election Now Open! Elections for MGSS’s 2015-16 Executive Council have now begun and voting will remain open until Monday, April 13th at 5pm. Casting your ballot only takes a couple of minutes! Please follow this link and log in with your McGill e-mail: https://ovs.pgss.mcgill.ca/. “What knowledge will Canada need to thrive in an interconnected, evolving global landscape?” Add your voice to this national dialogue on the role of graduate research in building Canada’s Future. Featuring a keynote address by Professor Will Straw, Director of the McGill Institute for the Study of Canada. Followed by a panel discussion and roundtable session with graduate students discussing the SSHRC Future Challenge Question “What knowledge will Canada need to thrive in an interconnected, evolving global landscape?” Event attendees will be invited to actively participate in the roundtable discussion. Attendance on the part of McGill faculty is also encouraged. As the winter semester approaches its conclusion we’d like to invite you to join us for our final general assembly of the current academic year and end-of-term party. This event is a wonderful opportunity to celebrate and to reflect upon our accomplishments over the last year with free food and wine, music, and good company. The general assembly will be held on Monday, April 13th at 5:30pm in A-832. The party will follow the conclusion of the assembly. An agenda and supporting documents will be sent via e-mail on April 6th. But, as we look toward the past so too do we, like Janus, look toward the future: we are now accepting nominations for the 2015-2016 MGSS executive committee. As a member of the executive committee you are in an excellent position to foster community at the Schulich School of Music and to positively shape the experience of its graduate students. Its also an excellent opportunity to develop leadership skills working with a variety of other groups on campus. 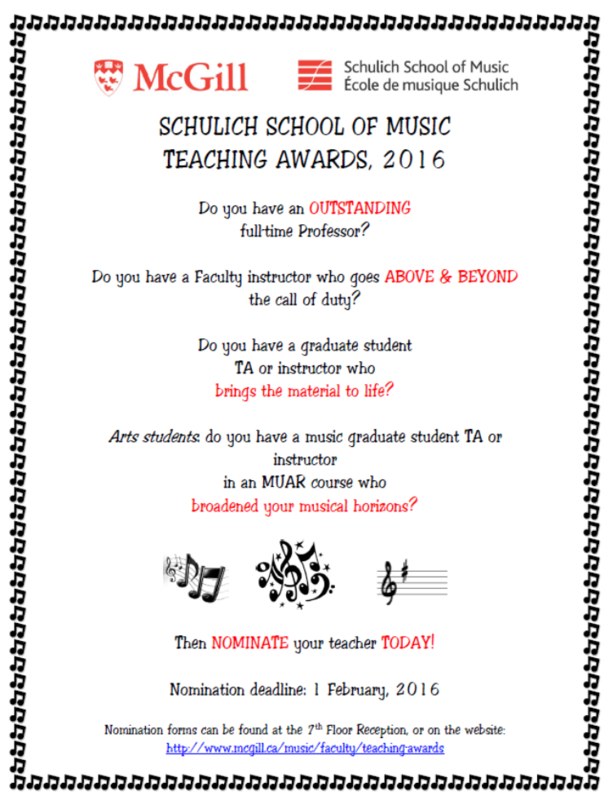 Nominations should be sent via e-mail to mgss.pgss@mail.mcgill.ca by Friday, April 3rd at 5pm. You may nominate yourself or a colleague. The available positions are President, Vice-President, Secretary, Treasurer, Symposium Chair, Performance Representative, Research Representative, Member-at-Large, and three PGSS Representatives. More information about each position may be found in the MGSS Constitution. Online voting for the 2015-2016 executive committee will begin on April 6th and will remain open until April 10th. The results of the election will be announced at the general assembly. We look forward to seeing you on April 13th. Until then, best of luck with your end-of-term exams, performances, papers, and projects!